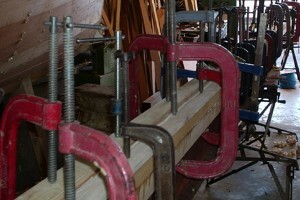 We are specialists in the construction of wooden masts and spars for classic sailing boats and vintage dinghies. We can produce solid or hollow spars to suit your specification, using top quality, specially selected timber, and modern reliable adhesives. Some of our spars are constructed from one piece of timber, others can be four, six, eight, or more pieces depending on length and requirements. Examples of our work can be seen on many boats on the river at Fowey, and other harbours around the country. Masts, gaffs, sprits, bowsprits, topsail spars, gunters, spinnaker poles, whisker poles, booms, made, repaired, restored.